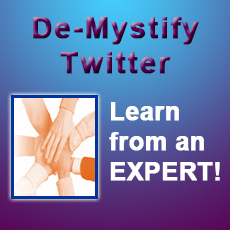 For a limited Time, Receive Your FREE Twitter eBook NOW, a $ 97 VALUE. There are numerous eBooks on Twitter promoting the fastest means to gain 1,000s of followers; many with valid information. So, how is this book different from the rest? You will receive a proven formula to build relationships through Twitter, building a referral business lasting a lifetime. Times have changed, no longer are customers wooed by commercials and pitches, they are looking for relationships they can feel good about. It is about building your market, building that “know, like, and trust” feeling, a community network, so that when you do have your products and services, you have people that are invested in you. 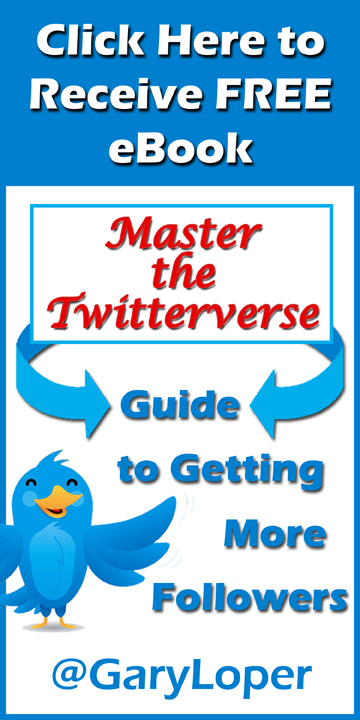 Follow ‘Master the Twitterverse, Guide to Getting More Followers’ and . . . Learn how to connect, engage and add value to your conversations. Build relationships based on people that will ‘know, like and trust’ you. Learn how to add more connections. How to find people to connect with that have similar interests. Gain a targeted audience; attract potential customers to your offerings. Learn strategies and tactics to become successful. What aspects you should avoid in Twitter. Discover the mindset to shift your business to SUCCESS. Uncover the ‘key’ Social Media tools. Learn the Social Media etiquette. Learn how to use Social Media to drive traffic to your website. Grow into a winning Business Builder. How to create a balance of business and personal relationships in Twitter. Develop confidence and increased ease. Information that is clear, understandable, written specifically for you. Gary Loper is a recognized Twitter Expert, Mindset Coach, Motivational Speaker, Trainer, Talk Radio host, and life and business coach, a highly respected entrepreneur, Helping People Master the Business of Life. Gary has a strong background in marketing and sales, and his 30+ years of customer service and 15 years of direct sales adds more depth to who he is. With his diversity in spiritual studies, relationship building, life and business coaching, and marketing, customer service and sales, his background is a perfect blend to help others to be their best, in life and business. He teaches his audience strategies and tactics on how to become successful, to produce and maintain positive solutions, to stay in a positive mindset, and attract and manifest true wealth. Gary empowers people to discover their gifts, develop confidence and create better relationships with themselves and others in their lives. He is a lifetime student of personal growth and motivation. With more than 250,000+ connections on Twitter, a highly respected entrepreneur, a Twitter Expert, and a Business, Life and Social Media Coach, Gary has been instrumental in helping others build a huge following. His specific guidelines dramatically will drive customers to your website and shift your business to a level of success. What’s more, his truth-seeking philosophies flow over into his thought provoking, inspirational messages. Gary has built a huge following based on adding value to people’s lives, sharing his knowledge, beliefs and philosophies in his messages. He has incorporated into his platform ‘Just for Today’ messages. In October of 2012, he started the #JustForToday conversation on Twitter, and has received tremendous responses from people who have gained inspiration and renewed hope in themselves from the messages. Thank you …… Here’s to Your Success!